The spanking new BMW X6, the brand's first sports activity coupe, is a dashing automobile pumped up with the brand's superior mechanics. The spanking new BMW X6, the brand's first sports activity coupe, is a dashing automobile pumped up with the brand's superior mechanics sheathed in an angry shade of crimson. Unveiled at the BMW showroom in Bangalore, the model of covetable proportions is a treat for the senses. Philip Von Sahr, President of India Operations, BMW, elaborated on the company's plans for India. "If we are to benefit from the dynamics of the Indian market, we need to act today. Since we set foot in India, we have continued to build our operations and have increased the number of locally produced car models. Today the BMW plant in Chennai locally produces up to 8 models in India- the BMW One series, the BMW 3 series, Tourismo, five series, seven series, the BMW X, X3 and BMW X5. Together the two assembly lines have the capacity to locally produce up to 14,000 units." "Using locally produced components - celebrating the Make in India initiative - BMW has strengthened its commitment to the Indian market by increasing its level of engagement at the BMW plant by up to 50%. BMW India has announced brand-new prices for its entire range of locally produced cars. Today BMW in India has the largest, youngest and most attractive product portfolio within the luxury market in the country." You can't help but agree when you see the car, poised and primes for perfection on the roads. It's edgy contours trace a fluid silhouette, sloping down to a streamlined rear. The extravagant, emotive feel of the second generation model in the BMW X series reveals itself in a spurt of classic design elements re-rendered into a compact package of power. 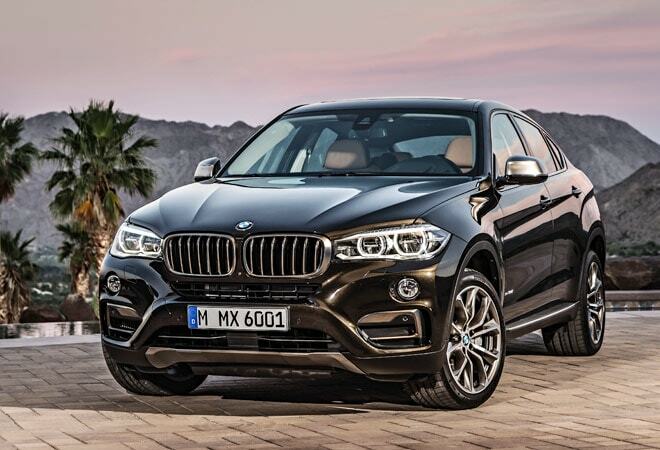 The BMW X6 is a beefy version of a sports action coupe rippling with barely concealed power. Having pioneered the Sports Activity Vehicle segment with the BMW X5, the brand has fine-tuned the second generation model to pack in lots of space within a sporty silhouette. Weaving the ethos of the brand into the very design of the cockpit, the hallmark BMW driver oriented design resonates in the intuitive control and display elements, an elevated seating position and lines that streak from the instrument panel to the door to form a ring around the interiors. The plush interiors fitted with standard Dakota or optional Nappa leather upholstery interior are edged with trims lending a subtle feel of tempered luxury. Despite its elegant coupÃ© character, the all-new BMW X6 is spacious lending credence to the sports activity vehicle label. With the seat backrest in an upright position, the luggage compartment in the BMW X6 offers 580 litres of storage space. The most intriguing part, perhaps, is the BMW xDrive-an intelligent all-wheel drive system that monitors the steering component and distributes drive power smoothly between the axles. It splits drive between the front and rear axles to suit the driving situation as well as the surface. Under normal driving conditions, xDrive works with a basic 40/60 torque split front and rear. Any abrupt change in friction between the road surface and the wheels is balanced with a torque split that can be varied within a fraction of a second without any tangible tremor in the car. The BMW TwinPower Turbo six-cylinder in-line diesel engine is remarkably responsive and delivers agile power delivery at any engine speed and astonishing efficiency. An output of 230kW/313 hp produces a maximum torque of 600 Nm at 1,500 - 2500 rpm and accelerates from 0-100 km/hr in just 5.8 seconds to a top speed of 240 km/h. The new eight-speed sport automatic transmission stands out with its exceptional precision and impressive fast-shifting ability. In any gear, the transmission collaborates instinctively and effectively with the engine. The 'Adaptive suspension package Comfort' combines Dynamic Damper Control with air suspension for the rear axle provides ultimate drove comfort. "The BMW X6 was the first of its kind and the second generation once again perfectly combines the BMW X qualities with our allegiance to the coupe. It's uniqueness is borne from its modern design that combines athletic and elegant details. The design modifications include a large front, horizontal chrome grille and angled slats and new LED taillights," says Sahr. "The creation of SAV segment by BMW has opened up distinctly new dimensions for vehicles. Till now, the BMW X5 was the only vehicle with off-road capability that could be driven like a sportscar. Now we have the stunning X6."